With an increasingly attractive business environment and developed information technology, Danang is on the way to realize its goal of becoming “Singapore of Vietnam”. In the past five years, this city has seen a boom in construction, with US$4.5 billion spent on infrastructure projects. In addition, for eight consecutive years, Danang has always topped the Provincial Competitiveness Index (CPI) in terms of good governance and policies for business environment. Danang is the third-largest city of the country and a center of trade and education in Central Vietnam. This city is famous for its clean environment, beautiful beaches and good public services. It was considered a place worth living in Vietnam. Two of the most important infrastructure projects in the city are the Danang Hi-Tech Park and the Danang IT Park. The first is being built. Upon completion, it will cover 1,129.76 hectares. The project is expected to promote the development of science and technology for the city, by attracting local and foreign investment. 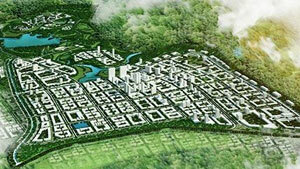 The Danang Hi-Tech Park has offered attractive financial incentives. Specifically, investors will enjoy a preferential corporate tax rate of 10% for 15 years after earning turnover. In addition, they are exempted from corporate income tax for four years and 50% reduction in the next nine years, starting from the first year with taxable income. The Danang IT Park also provides incentives for high-tech enterprises in corporate income tax. Specifically, the tax rates applied within the first four years since earning a profit is 0%. During the next nine years, this rate will be 5% and the next two years 10%. Land rental is also free for up to 50 years for "reliable tenants", depending on the type of industry and investment size. Other key infrastructure projects include building an airport valued at US$60 million, a new town hall worth US$88 million, and a three-storey US$93 million bridge. Furthermore, a surveillance system installed by IBM will help track down buses and check water quality. The Cisco Systems was installed with 300 km of optical cables, connecting all government agencies in the region. Another important work of Danang, which is a symbol of development, is the Dragon Bridge. The new bridge spanning the Han River has appeared in many international newspapers for its stunning design. Not merely a building with beautiful architecture, Dragon Bridge is also a symbol of the city’s power. Danang is on track to become a modern city with an efficient and transparent management system. With a business and investment environment that has become more improved, plus many financial incentives, the city deserves the title of "Vietnam’s Singapore".